Actually I wanted to ask Reinhold Messner these questions during the International Mountain Summit in Brixen. But a planned press conference was cancelled and the 69-year-old left the venue in no time at all, for whatever reason. But I had not to wait a long time for the South Tyrolean. He came to me – in a way. Last weekend the most famous mountaineer of the world gave a lecture in my home town of Cologne. Before the event started Messner answered my questions. 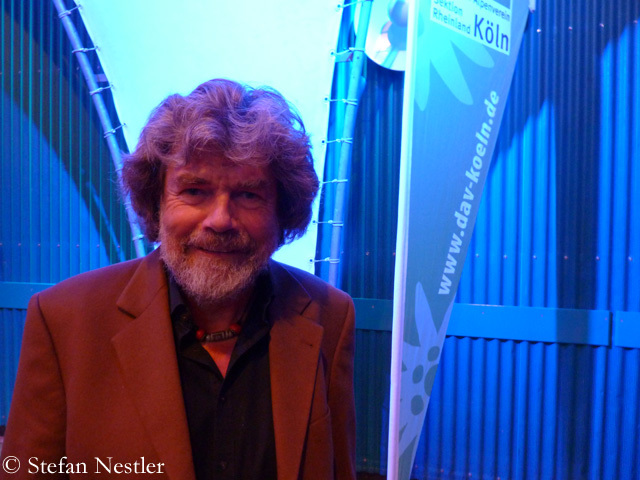 Reinhold Messner, recently you visited Pakistan, a few months after terrorists had shot eleven climbers at the Diamir basecamp on Nanga Parbat. Describe the atmosphere down there! The mountain has not changed, but the connections are much worse than I thought. The terrorists were contract killers close to the Taliban, paid to carry out a bloodbath. Originally they had a different target. A great festival with polo games etc. was cancelled, probably because the organizers were worried that something might happen. Then the hit squad turned to Nanga Parbat. After the assault the killers took their money and disappeared. Some of them have been arrested, but nobody knows who has been the principal. On the one hand the terrorists wanted to hit the north of Pakistan, the local tourism, which collapsed by 90 percent. But they also wanted to hit the western world. Fortunately there have not been more victims. There were more than 60 people on Nanga Parbat, but most of them were at the high camps then. 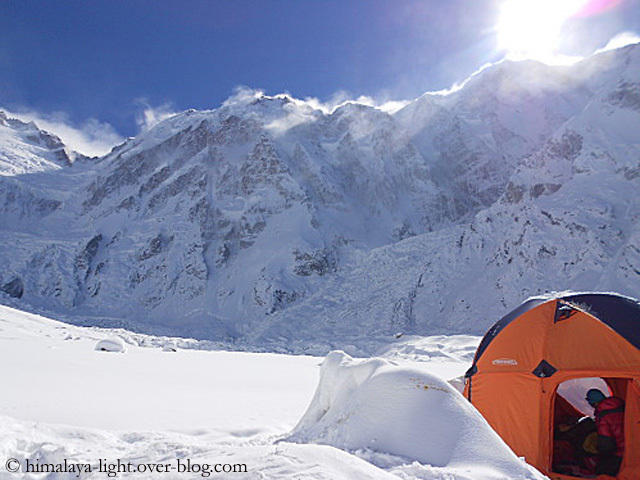 Do you think that climbers will avoid Nanga Parbat in the next few years because of this summer’s assault? There are already requests for new expeditions. But the Diamir face is and probably will remain locked. The south and the north side of the mountain remain open. You can go there on winter expedition. The northern part of the Karakoram around the K 2 has not been affected, there were no problems. But I have also learned in my research that above Chilas, at the entry of the Diamir valley, four busses were stopped, all the men were taken out and shot. Women and children had to watch the massacre, then they were chased away and the busses were set on fire. And on the Babusar pass, which leads from the Swat valley along the Nanga Parbat to the Indus valley, jeeps were attacked in the same way. These news did not reach Europe. But now terrorism has also reached the north of Pakistan. 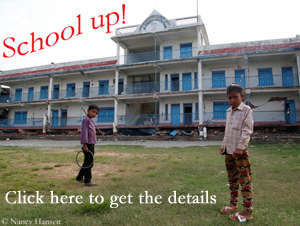 You have initiated aid projects in the Nanga Parbat region, including three schools. Is there an atmosphere of fear among the locals? I was worried that these Taliban forces might have an interest to burn the schools, because also girls are going to some of them. This is clearly not the case here. But I have stopped my aid to Pakistan, out of concern that the whole thing falls into civil war. This would be a pity. I only keep the projects alive that we have initiated, I continue to pay the teachers as promised. But otherwise I ‘m moving the aid of my small foundation mainly to Nepal. Right there, in Nepal, Swiss top climber Ueli Steck has caused a sensation by climbing solo through the Annapurna South Face. What is your view on this performance? 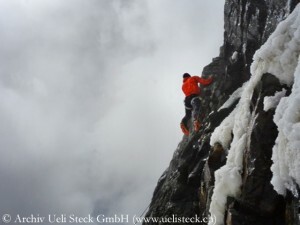 Ueli Steck has not been very lucky this year on Everest. The attack at Camp 2 has actually not been directed at him. The Sherpas wanted to hit others, real parasites. 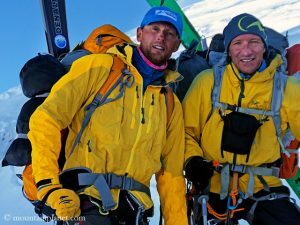 Steck and Simone Moro are no parasitic climbers, even if they used the fixed route via the Khumbu Icefall, without having talked to the Sherpas or having paid them. Last year Ueli Steck climbed Everest via the normal route which was not “Steck-like”. 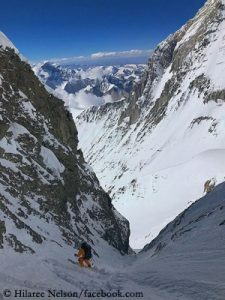 But what he did now on Annapurna, was again typically Ueli Steck: Climbing quickly, climbing at night to avoid rockfall, via a very difficult wall. He had tried the South Face twice before but failed, once even quite dramatically, because he was hit by a stone. I really have great respect for this climb. The way he did it is the only one that allows you to climb such a difficult and dangerous wall in Alpine style. Steck has lost his digital camera during his ascent, he had no GPS tracking. Do you think that a stain clings to his climb because it is not completely documented? Once again we see critics who in fact have problems with themselves. As Ueli Steck describes his climb it is absolutely comprehensible. He is climbing solo, he loses his camera, there is no partner who has a second camera in his backpack, and he has no GPS system. I see no reason to doubt. If he does not have the ability, whoever else should have it? It is clear that doubts have arosen mainly in Switzerland where Ueli Steck has become so dominant in the creativity of modern mountaineering and where of course are rivalries. That is human nature. But to spread rumours like “Yes, it could be, but maybe not” via internet or pass them on to journalists, that’s no recommendation for climbers. In other words: Ueli Steck is not in need of telling lies. Is the German Alpine Club (Deutscher Alpenverein – DAV) in need of offering commercial Everest expeditions as he will do next spring with the DAV Summit Club? The German Alpine Club has not just my approval, but exceptionally I can understand it. The DAV has contained itself on Everest for such a long time. But there is no difference whether I prepare a route on Everest or on Gasherbrum I or II or Dhaulagiri or Nanga Parbat. The DAV has played this game for many years by offering 8000ers which were prepared for mass ascents. I was on Mount Everest last spring and had to change my mind. The basecamp was perfectly clean, the toilets of the high camps were flown out every other day. 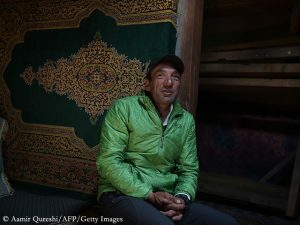 Now the expedition agencies are so experienced that they work things out with each other: Who is responsible for Camp 2? Which cook is up there? Who will fix the last ropes from the South Col to the summit? This is so well-organized that there are no more jams because the groups – or should I say the clients, the tourists – are led up to the summit one after another. Why should the DAV stand back? That’s just the biggest hype. I guarantee that within ten years commercial expeditions to all 8000ers will be offered in spring, summer or autumn depending on where they are. The international agencies are very, very good. If you book an expedition with them you know: I will be well supplied in basecamp. They will take care that I’m well acclimatized and give me a good guide. And they ensure that I as an ordinary climber will very likely reach the summit and will probably not perish. However, the risk is not zero. 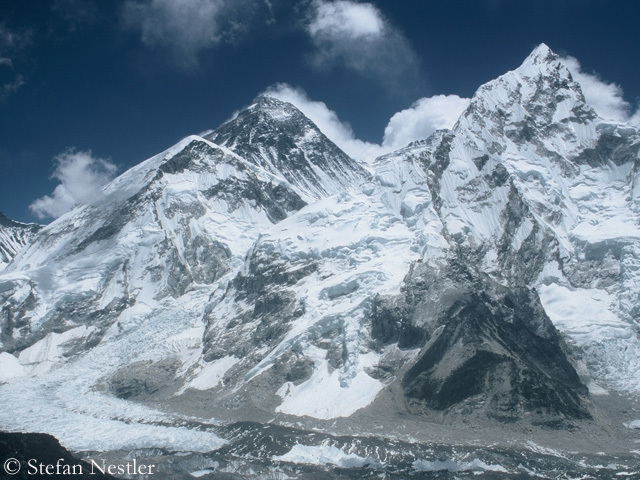 How do you judge the announcement of the Nepalese government to set up an outpost at Everest basecamp with observers who shall ensure that everyone plays by the rules? I do not see why they should bureaucratize the mountains more and more. The climbers themselves must be able to decide what to do or leave undone so that there is enough room for all climbers on the mountain. And there is room for everyone. The self-sufficient, traditional climbers shall go where the others are not, where they can climb alone and in their style. Each style is justified. The tourists have conquered Mount Everest because the agencies are working so well. If we do it in the Alps for 150 years, why should we ban it on Everest?